Note 1: When the angled end is plugged into a typical SATA drive, the cable angles towards the PCB side of the drive. 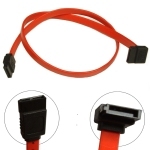 Note 2: Customers have reported that due to the slimline design of the right-angle connector these cables are particularly suitable for Dell Dimension 5000 series and 9100 series PCs and also HP XW4400 series workstations. We offer these cables in two lengths (0.5M and 0.75M), so choose the length that best suits your exact machine.